It does not matter what brand of camera you love, each camera has different features that work for all different types of photographers. If you are a Nikon user, you may or may not have the newest version - the Nikon D810. If you have considered upgrading to the newest one day in the future, we wanted to share with you 5 cool things that you should know about the Nikon D810 before you buy! 1. The Nikon D810 has no OLPF/AA filter. The Nikon D810 does not have the two low pass filters, so there is nothing that needs to be cancelled out. Only a regular filter stack (mostly to combat UV) is present in front of the camera sensor. There is practically no difference between the D810 and the D800E which reveals that the Nikon D800E filter stack was probably designed that way for cost reduction reasons. Now there is no need to do that, since both D800 and D800E have been combined into one line. 2. EXPEED 4 offers better autofocus performance and is 30% faster. The EXPEED 4 processor applies faster calculations to fast-changing scenes, which in turn improves autofocus speed and accuracy. The Nikon D810 gains exactly the same autofocus system as the D4s, so we can expect similar improvements in performance. With a roughly 30% faster processor, the D810 can process images faster too, so the improvement is not only limited to the autofocus system. Thanks to the faster processor, images are also handled faster and more aggressive noise reduction algorithms are applied at high ISOs in the imaging pipeline. EXPEED 4 also translates to faster frames per second and other performance gains listed below. 3. The battery and MB-D12 are compatible. No need to worry about buying different batteries for the D810 if you are upgrading from the earlier version, because the older EN-EL15 battery is compatible with the D810! In addition, the MB-D12 battery grip for the D800/D800E is also compatible with the D810, which should make it easier for existing Nikon owners to make the transition if upgrading to this version. 4. Electronic Front-Curtain Shutter completely eliminates camera shake. As a photographer you probably know how simple shutter vibration can impact images when shooting at slow shutter speeds. The new Electronic Front-Curtain Shutter on the Nikon D810 is amazing for this issue! When shooting, once the mirror is raised and the camera is in Live View mode, the shutter does not have to close and reopen at the beginning of the exposure. The shutter is only lowered at the very end of the exposure, which obviously does nothing to introduce potential blur. As long as you do not have continuous vibrations due to wind or other factors, the Electronic Front-Curtain Shutter will give you sharp, blur-free images. This mode will also work in Mirror Lock-Up mode, so it is not just limited to Live View! 5. Lower Base ISO of 64 and Higher Native ISO of 12,800. Most of you know that cameras give the best dynamic range at the lowest base ISO. With the D800 and D800E, the base ISO was 100, so you get the best performance at ISO 100. Although these cameras offered a “low boosted” ISO of 50, it is not native to the sensor, meaning that it is a software boost, which only reduces the dynamic range. With the D810, the base ISO is 64, so it is native to the sensor. This means that the best dynamic range on the D810 will be at ISO 64 and you can further “low boost” it to ISO 32. Having the ability to shoot at ISO 32 means you might not need to carry your ND filter when you need to use a slower shutter. For photographers that want to shoot wide open with fast f/1.4 lenses or with flash in bright daylight conditions, this is a definite plus. The native ISO range has been also been expanded to 64-12,800 range from 100-6,400. This means lower amounts of noise at high ISO levels, particularly past ISO 1600. So, what do you think of all these cool features and upgrades? If you are a Nikon user, tell us in the comments below what your favorite feature of this camera is. These are just a few of the cool features that the Nikon D810 offers to its users. To see even more cool thing that the model offers, check out this post on Photography Life. Are you looking to purchase your own Nikon D810 or want to upgrade? If you are looking to purchase your own, check out this Nikon D810 today. Cameras have really grown and upgraded over the years since they were first created. A UK-based photographer named Marco Marques own an impressive collection of about 50 vintage cameras that he displays in his office. 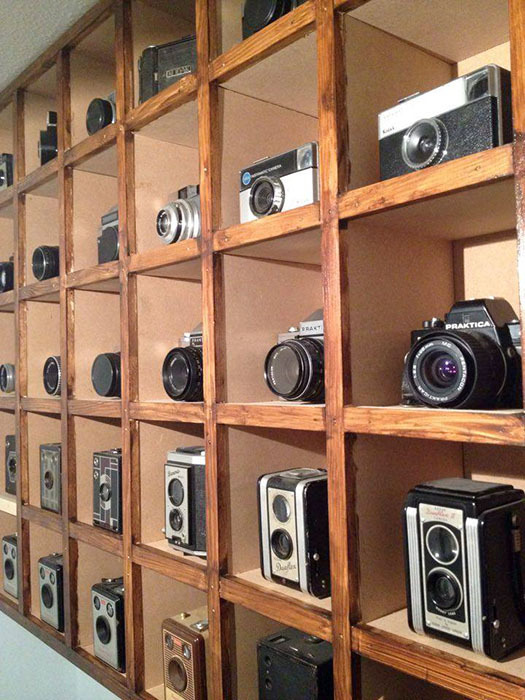 He had a custom shelving unit made to display all of the amazing cameras on the wall. These photos, which we originally saw on PetaPixel, will show you this photographer's collection of vintage cameras which we find pretty amazing! Marques told PetaPixel, "It was my mum who got me into collecting vintage cameras. She knew my love for photography and one Christmas she bought me my first vintage camera, and Agilux agiflash, and this is where it began." Marques estimates that he has spend about £300 over the years in buying his cameras, mostly from car boot sales and garage sales. Pretty amazing, huh? Interested in the different cameras of the past? Check out this blog post to see a great infographic on the history of the photographic camera.